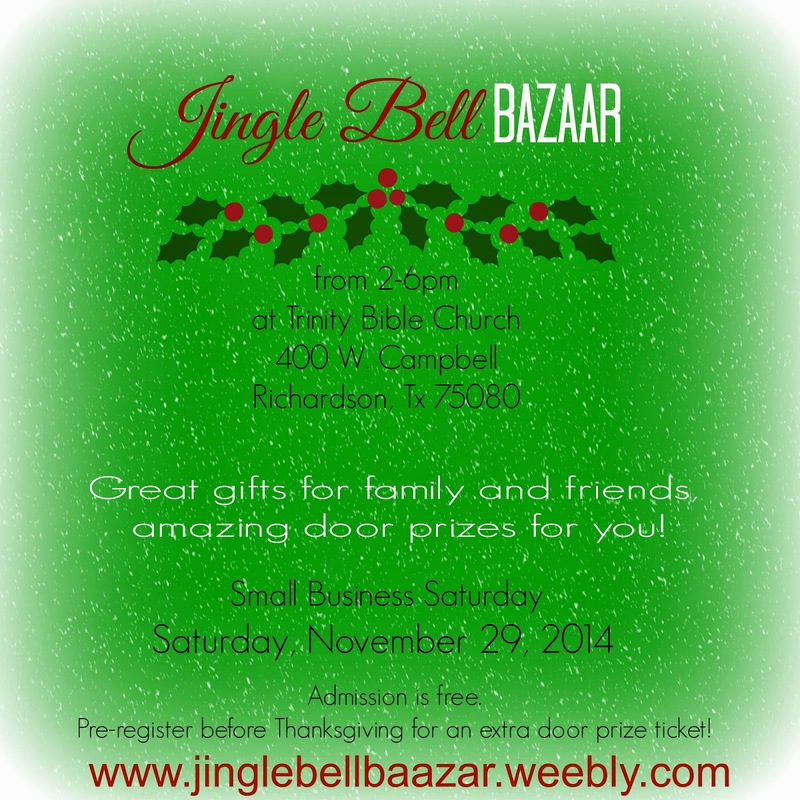 "The Jingle Bell Bazaar is coming November 29, 2014 to Trinity Bible Church in Richardson! It will be a one-stop shopping experience with great gifts for friends and family and amazing door prizes for you. Admission is free! Pre-register to attend for an extra entry into our door prize drawing!" "FARMSHOP, along with the Villages of Fairview, is excited to announce the opening of our 2014 holiday market located in the heart of the Villages of Fairview, one of the most renowned retail areas in the state. The Villages of Fairview is surrounded by numerous additional retailers including the Villages of Allen, as well as the Allen Premium Outlets. FARMSHOP is located in a very high volume consumer traffic area bringing in potential buyers from all over. We occupy a 20,000 square foot indoor space, which includes a coffee bar, local food shop, a health and beauty area, space for cooking demonstrations, as well as a year round indoor farmers market. FARMSHOP's holiday market will start November 22, 2014 and will be open every Saturday and Sunday through December 21." "Free Event! Come see Santa! Live Music, Special Performances, Shopping, Pictures with Santa!, Food, Choo Choo Train, Unlimited Museum Play, Raffle, & Much, much, more! Come help support community as we roll out part 2 of this community initiative to help save Imagination Station & Keep the doors open. This place is so amazing for children and we need this in Johnson County. If you can help in anyway with sponsorship, please contact us! We love our community and the support they exhibit towards small business, and that's WHAT WE ARE ALL ABOUT!" "2014 Home for the Holidays Craft Fair - Event is free and provides shoppers with a blend of traditional and one-of-a-kind gift ideas for Christmas." "Grapevine Market is held every Thursday and Saturday April through October. Located in Liberty Park across from City Hall, Grapevine Market features a variety of vendors offering home decor, collectibles and much more." A Prime location is defined as a booth that includes at least one of the following: corner location, highly visible location or slightly larger by no more than 3 ft in either direction. Tables and chairs are not provided. There will be a hospitality area for vendors with water and coffee. Food trucks will be on site and they will offer a lunch menu for delivery to your booth. Applications are available here and are due by March 01, 2015. For more information, visit their website or contact their event coordinator at highlandercf@att.net / (817) 266-3473. "Shop Local • Shop Handmade • Shop Funky! The 7th Annual Funky Finds Spring Fling is a FREE 2-day family AND pet-friendly handmade shopping event! Bring the family and be a part of the funky fun featuring over 120 Artists, Crafters, Designers, Authors & Food Makers selling their unique hand-crafted items! Attend Both Days...it's that FUNKY! There will be 100+ Makers Selling Uniquely Hand-crafted Wares, 150 Swag Bags & Charitable Raffle, Pet Adoptions by HSNT, Funky Finds Balloons for All, Event T-shirts for Charity & More!" Booths are 10 X 10 and cost $165.00. This fee includes event t-shirt, your linked logo on the 7th Annual Funky Finds Spring Fling website for one year, listing on promotional items, 10% on booklet advertising, opportunity to have a listing on the back of Event & Vendor T-Shirts, opportunity to donate promotional items to 150 swag bags, and event promo postcards to distribute. Tables and chairs are available for rental. Applications are available here and are due by January 4th, 2015. For more information, visit their website or contact their event coordinator at handmade@funkyfinds.com / 903-665-7954. "Paschal High School Band's annual Gift Market is Saturday, November 22, 2014 from 9 a.m. to 4 p.m. Admission and parking are free. This all-day gift market features unique arts and crafts, handmade gifts and products offered by more than 60 vendors, plus fantastic homemade desserts. All proceeds benefit the award-winning bands at Paschal High School. Come out to shop for the holidays, enjoy great desserts and live music from our band students." "This Craft Show will have a little bit of everything for any shopper. Shoppers can come out and get there early Christmas Shopping started. "​ There will be live entertainment with the Sachse Madrigal singers performing holiday music selections. Free parking and admission." Booths are 6 X 6 for $50. Electricity is available for an additional $5. This fee includes 6ft. table, two chairs. Applications are available here and are due by November 22nd, 2014. For more information, visit their website or contact their event coordinator at meganvictor.events@gmail.com. Booths are 7 X 6 and fees are $45/day and $85/weekend. Vendors must provide their own 6 X 2 table, linens, and chairs. Each vendor will receive a 20% off coupon to be used in our cafe on any item for each weekend that they attend. To apply, please email their event coordinator at jholbert@farmshopcenter.com / 214-763-0485. "Richardson High School Eaglette Holiday Craft & Gift Fair with 70+ vendors, bake sale, raffles, fancy formal for resale, performances, Salvation Army, Angel tree, and more!" This fee includes electricity & lunch. Applications are available here and are due by December 6, 2014. For more information, visit their website or contact their event coordinator at rlclorraine@yahoo.com / kenvahell@yahoo.com. Last weekend seems to be the last of welcoming warm weather for your winter shopping. Baby, it's cold outside, but it's also mid-November, so I suppose all is as it should be. Cuddle up with those blankets, and join me as I reminisce about our last cozy craft show experience. The 8th Annual Guyer Choir Craft Show had over 140 vendors lining the halls of the Guyer High School and featured a large variety of artists, crafters, and consultants. Here are just a few examples of the amazing talent I saw! These two vendors shared their booths, and their colorful and creative products complimented each other perfectly. 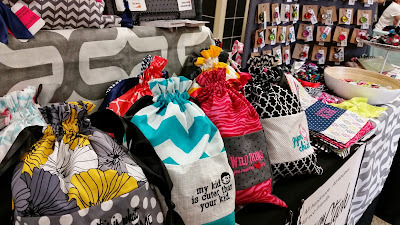 From these adorable, handmade, sassy bags (From Steph) to their cute and quirky bottle cap jewelry (Eye Candy), there was a little something for everyone to be found here. These are so cute, you guys! 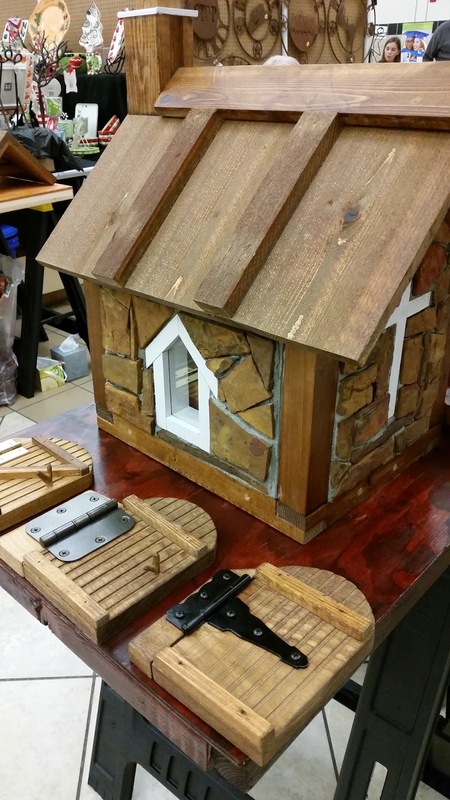 Texas Elf House creates little elf houses and tree doors to decorate your yard with. These magical little accessories are perfect for sparking and encouraging imaginations for all ages. A.W.A Studio's booth stopped you in your tracks with their delicious scents--leather, firewood, and tobacco were just of the few unique scents they have to offer the true Texan in your life. Though it was the smell that caught my attention, it was the gorgeous pottery that kept me lingering. 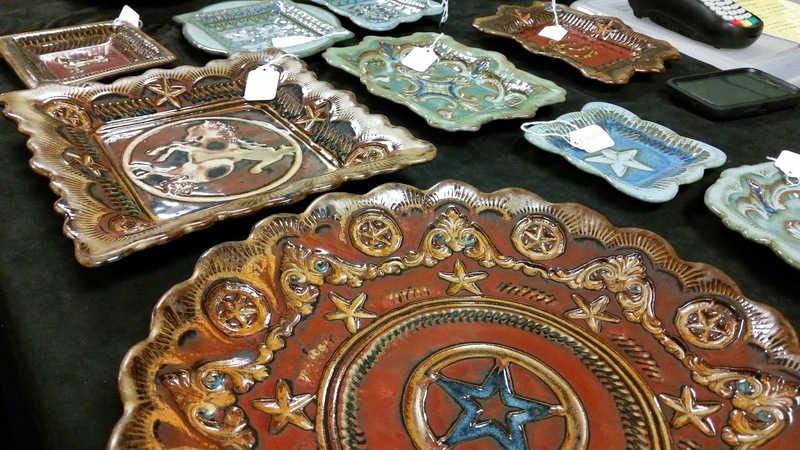 These beautiful dishes are all carved by hand, no stamps, and are also made right here in Texas. I had a wonderful time chatting with another batch of amazingly talented folks at the craft show this weekend. It was so great to hear that some of you already knew about DFW Craft Shows, and it's always fun to introduce myself to new vendors who are looking for help finding shows. Hey, that's what we are here for! Welcome, I hope you'll stay a while. "Craft Fair - All home made goods (crafts, foods, jewelry, art and etc.). Food and beverages available for purchase." Booths are 6 to 8 foot tables, or bring your own. Let them know if you need or have extra tables to bring. This fee includes 1 table. Some electric outlets are available. Lunch items for purchase. You can do raffles. To apply, please email cspiker6@yahoo.com ASAP. For more information, contact their event coordinator, Julie, at cspiker6@yahoo.com / 214-802-5095. "A unique blend of original arts/craft, unique gifts & product lines, edibles and more :) Approx. 100 booths indoors, 20 booths outdoors." 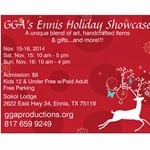 "Annual Holiday Gift & Craft Show - Free Admission, Free Parking, 2 days of shopping. Food & Drink, Prize Drawings & Entertainment, Unique Gift Ideas: Jewelry, Clothing & Accessories, Home/Seasonal/Decor, Bath & Body!" "Come shop the Burleson Area Chamber of Commerce Holiday Bazaar featuring local apparel boutiques, home decor, yummy treats, and many other holiday necessities. Find all of your Christmas gifts in one place while listening to holiday tunes, taking fun Christmas pictures, and enjoying a variety of food trucks. You will not want to miss out on the fun!" Admission is $5 and includes wrist band to come and go as you please. All proceeds benefit the Burleson Area Chamber of Commerce, a 501-c(6) non-profit organization, and supports its mission of promoting local business. "The proceeds from this event benefits the only shelter in Colin County, Samaritan Inn, who helps or houses individuals and families that are in dire need. Unique and quality items will be available from local artisans, craftsmen, and distributors. Enjoy this relaxed and fun holiday shopping atmosphere. Make a purchase for yourself, home or family. And find that perfect Christmas gift for co-workers and friends." "Shopping, Food and Fun for the entire Family while supporting the Haltom High School. Kid friendly area. Please join us as we have 2 Food Trucks coming with B B Que and also Snow Cones. Vendors and Small Business owners will be showcasing there wares to make your shopping easier!!" "Come shop our Mistletoe Market at Crosspoint Church in McKinney! We will host 50+ vendors and food trucks. We will also be having face painting, a bounce house, a bake sale, and a used children's book sale for the kids. This will be our 5th annual event and look forward to another great start to holiday shopping and community fellowship." 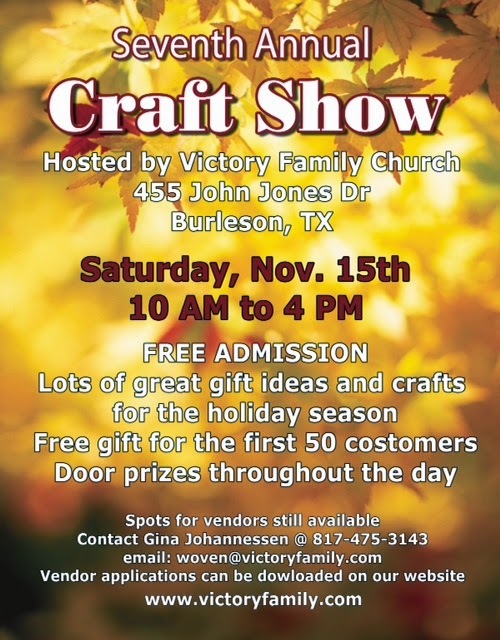 "Victory Family Church Women’s Ministry is hosting its 7th Annual Craft Show. 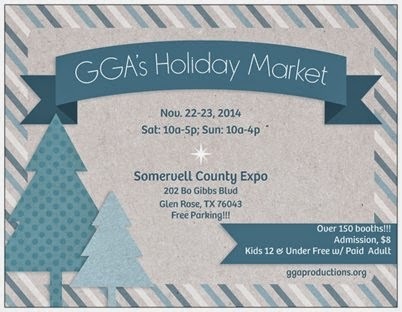 There are over 90 vendors indoor and outdoor at 455 NW John Jones Blvd., Burleson, TX 76028. Handmade and Manufactured items. And much more! Entry and parking is FREE. Free gift and coupon book to the first 50 customers. " 455 NW John Jones Blvd. "Westminster Presbyterian Church (WPC) in southwest Fort Worth will host a Holiday Gift Market on Saturday, Nov. 15, 2014, from 10 a.m. to 3 p.m. Vendor categories include bath & body, clothing & accessories, home décor, food and gifts for children, adults, pets and more. 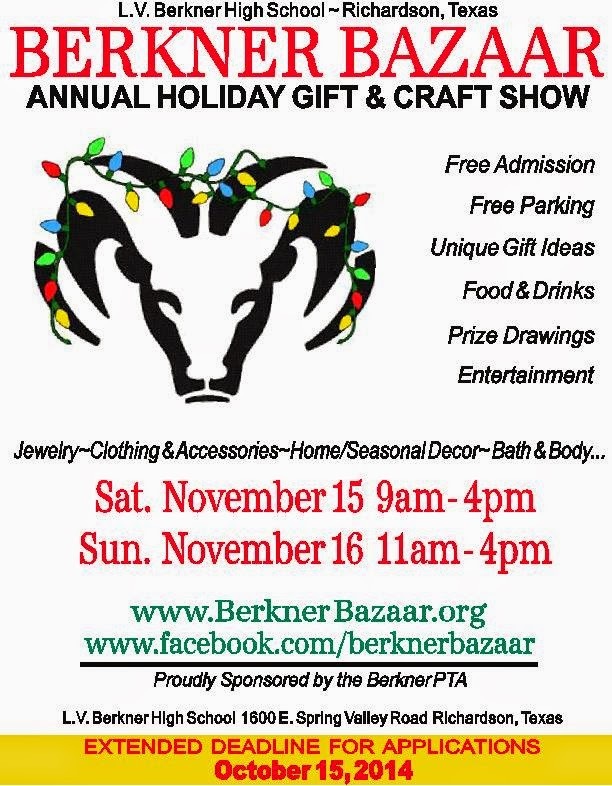 There will be handmade crafts, lots of raffle items and a Cozy Café for tired shoppers wanting take a break. There is no cost to shop! All proceeds benefit local and international causes such as Tarrant Area Food Bank, Presbyterian Night Shelter, Union Gospel Mission, Bread of the World and Haiti Education Fund, among others"
"Arts & Crafts event at Cobra Brewing 40+ vendors, Free booth Space. local vendors, local music Locally made Spices, Sauces, soaps, décor and more..."
To apply, please email info@cobrabrewingco.com and by November 15th, 2014. For more information, visit their website or contact their event coordinator at info@cobrabrewingco.com / 972-221-2337. Booths are 10 X 10 and cost $70. Electricity provided if needed, tables are limited but available on request, snacks provided for vendors. Applications are available here and are due by November 18, 2014. For more information, contact their event coordinator, Debby, at ddtooke@garlandisd.net / or Tina, tmcrouse@garlandisd.net / 972-765-5820. "MacArthur Blvd. Baptist Church invites you to 'shop 'til you drop' at their annual Craft Fair & Gift Bazaar. Come and shop for unique gift ideas that will be great for holiday giving, birthdays, or “just because” gifts. There will be a variety of items for purchase: gift baskets of jams & jellies; handmade cards, jewelry, and scarves; Mary Kay Cosmetics; original paintings, South Hill Designs Jewelry “Aria” Lockets; personalized Christmas tree skirts and stockings, table runners; embroidery items, Christmas ornaments, and aprons; home décor, wreaths, frames, and quilts; baby blankets and quilts; Premier Jewelry; Advent calendars; handmade blankets for all ages; and much, much more." Just off MacArthur north of I-635 in Valley Ranch. Vendor booths are FULL for this event. For more information, contact their event coordinator, Linda, at dcwomen@mbbcirving.org / 214-924-9218. "Broadway Baptist Church of Fort Worth's annual Holiday Market is scheduled Saturday, November 8th, 2014 from 10:00 a.m. - 4:30 p.m. Our holiday shoppers will be looking for exceptional arts, crafts and unique products marketed by local artisans and small business owners. Holiday entertainment will also be presented periodically throughout the day for our shoppers. Kick off your holiday shopping fun at Broadway Baptist Church! The Holiday Market will be located inside the church (please use entrance on the east side of the church building). No admission will be charged." "The 2nd Annual Christmas Festival is held by the East Gate of NASJRB at the East Gate Village. Come join us in celebrating the gift of giving and supporting small business. Shop from nearly 100 vendors from the DFW area. Bring a toy for Toys for Tots or a canned food item to support military families in need. Don't forget we will have pics with Santa and a lil surprise. " "5th Annual AHS Extravaganza. 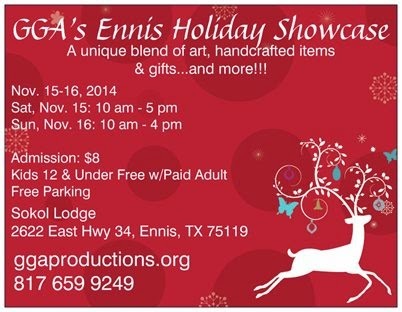 Unique vendors, fabulous shopping, yummy baked goods, raffle, Fall decor, Christmas decor, clothing, home decor. Breakfast and lunch items available to purchase. Come shop for gifts and for yourself!" "A truly unique shopping experience. Hand made, repurposed, and art of all mediums. Indoor spaces and a shaded garden area that features singer/songwriters as well as additional vendors. Several artists create on the spot paintings, wood turnings and more. Special events and 'Paint & Sip Parties' on 1st and 3rd Saturdays." "We will have our Annual Fall Festival and a Craft Fair on Saturday November 8, 2014 from 11 till 2. We have Booths available for $30.00, please contact Tedra Jackson at 972-417-5909 to get additional information." Admission Fee: Asking for can food donations for entry. The Festival will have a fee to participate in games and rides. "Come to shop for unique, handmade craft items, or be a vendor and sell your own handmade craft items. There will be many new vendors as well as great repeat vendors with their beautiful products for sale. Food and drink will be available for purchase and you will be happily entertained by many school and local dance groups. Door prizes will be given away all day. " "Come shop in downtown Dallas at the El Centro College Fall PSSA Craft & Vendor Show! This event held twice a year, brings in various handmade and home-based business vendors from all over the metroplex. Admission is free, but you will have to pay for parking around the college. Or better yet, ride DART to the West-End station, walk across the street and shop for the holidays!" This fee includes table, two chairs, and limited electricity. Applications are available here and are due by November 26, 2014. For more information, contact their event coordinator, Kerri, at kerrismith@dcccd.edu / 214-860-2170. "A perfect opportunity to buy the love one(s) in your life a 'Gift of Love'. We will have jewelers, stores, crafters, and product distributors on hand to present a wide variety of gifts. For 2 days, we will be available in the luxurious North Texas Event Center (NTX). Don't miss this opportunity to ensure getting the perfect gift for the perfect love!! A $5 donation to charity will cover entry for you and three friends." Admission Fee: There will be a $5 donation that will cover the entry fee for you and three friends! Electricity and WiFi are available. Applications are available here and are due by December 31st, 2014.